Poor connectivity between areas of the brain may be at the root of severe mental illness. (Medical Xpress)—A neuroscientist at Rutgers University-Newark says the human brain operates much the same whether active or at rest – a finding that could provide a better understanding of schizophrenia, bipolar disorder and other serious mental health conditions that afflict an estimated 13.6 million Americans. In newly published research in the journal Neuron, Michael Cole, an assistant professor at the Center for Molecular and Behavioral Neuroscience, determined that the underlying brain architecture of a person at rest is basically the same as that of a person performing a variety of tasks. This is important to the study of mental illness because it is easier to analyze a brain at rest, says Cole, who made the discovery using functional magnetic resonance imaging (fMRI). "We can now observe people relaxing in the scanner and be confident that what we see is there all the time," says Cole, who initially feared his team might find that the brain reorganizes itself for every task. "If that had been the case, we would have had less hope that we could understand mental illness in our lifetime." Instead, Cole says, scientists can now make their search for causes of mental illness more focused – and he suggests at least one target of opportunity. 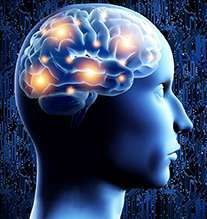 The prefrontal cortex is a portion of the brain involved in high level thinking, as well as remembering what a person's goal is and the task being performed. Cole says it would be useful to explore whether connectivity between the prefrontal cortex and other areas of the brain is altered – while the brain is at rest – in people with severe mental illness. "And then we can finally say something fundamental," he predicts, "about what's different about the brain's functional network in schizophrenia and other conditions." Those differences, in turn, could explain certain symptoms. For instance, what if a patient has visual hallucinations because poor connectivity between the prefrontal cortex and the portion of the brain that governs sight causes the hallucinations to replace what the eyes actually see? Cole suggests that's just one of the questions that analysis of the brain at rest might help to answer. Others include a person's debilitating beliefs, such as overly negative self-assessment when depressed. Opportunities to find better ways to improve patients' lives might then follow. Cole notes that current medications for severe mental illness, when they help at all, typically do not relieve cognitive symptoms. It is possible the drugs will reduce hallucinations or depressing thoughts, but patients continue to have difficulty concentrating on the task at hand, and often find it hard to find or hold a job. Cole says that even solving that one issue would be a major step forward – and he hopes his new work has helped advance science toward achieving this goal. What happened to the Default Mode Network? Mental "differences" will be minimized once it is recognized how important mental integration is. Most people are severely "handed". Mental issues could be decreased simply by having patients use the other hand more regularly. Hate labels, everyone is bipolar to some degrees (2 sides of any brain). Come to think of it, all creation is bipolar (duality of the ONE), so why is there an expectation the human mind would be any different?? ?